Roxana Illuminated Perfume: Tag, you are it! Okay, since I don't have a blog roll on this blog, the links are embedded in this post. I don't tend to read many blogs, way too many other things to do, and my favorites aren't really tag playing folk. 1. When I was in first grade at Holly Avenue School in Arcadia, I created an illustration for a book called something like The Crying Snail. I won first prize in a whole school competition. 2. I flunked first grade because I couldn't speak or understand English very well. 3. In the eighties I owned an apartment in Brooklyn Heights, a couple blocks from the Promenade. 4. I miss snow skiing with all my cousins in the Andes, along the border of Chile and Argentina. 5. I heard Donna De Lory's music in a yoga class and have been a huge fan ever since. 6. Lately I have been crazy about "animalic" type smells, like some of the really earthy native sages. Ok, here are six of my favorite bloggers... you've been tagged! Judy and I attended Otis/Parsons together, she inspired me to get a blog. Another brilliant, luminous being, playful with a beautiful heart and genius perfumer. Irene, art director at Tor books, she's smart and witty with a keen eye for art. A blog about Perfume, explored from a unique and interesting European perspective by Helg. James Jean, our favorite artist here at the house, he's brilliant. This blog is currently in sleep mode, but, plenty of material there to dive into. The blog is created by artist, poet and perfume advocate Heather Ettlinger. My other all time favorite blog has disappeared. Intending she will manifest soon in another incarnation. 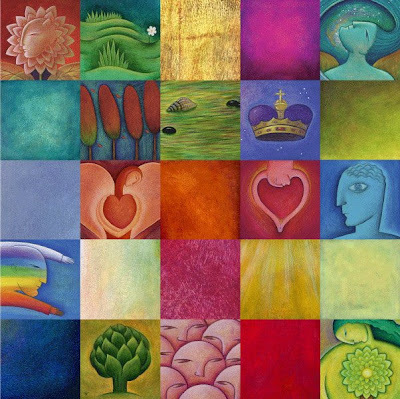 Image above ©Roxana Villa, this is a tapestry of different sections of many of my paintings. Roxi, I am such a looser when it comes to these things. I have done it several times over the years and feel like I am beginning to repeat myself and stopped doing them a while back. I love this painting, it is very quilt like. Nina, Ty and I just finished watching the movie Perfume today. Have you seen it? Very beautifully filmed and creepy. Judy! How lovely to have you visit. No worries on the tag game and thank you for the comment on the image. It is quilt-like indeed. I went to see Perfume the moment it was released here in LA. In fact I got my tickets in advance and went with a fellow fragrance lover. I enjoyed the film, but, like the book much better. My love to you and the family. Guess you all won't be trekking out this way for the big bash at Otis, huh? I'm speaking that day at Fashion Fragrance West, thus, I will not be attending the Otis shin-dig. Really lovely to meet you cyberly Krista. Great to hear that my intention with the blog is manifesting. Cheers to you and your beautiful vision. I accompany you te receive the price. It was a book. I got the the original of the painting. A proud father, I took it to Buenos Aires and hung it in my parents appartment. When they died and I went to unfurnished it. The crying snail was gone. Mistery ? Maybe he is still crawling from B.A. to L.A.